Karnataka PGCET 2016 Application Form: Karnataka Examination Authority (KEA) has published the notification regarding the PGCET 2016 Entrance Exam for admission to the post graduate degree courses such in management & Engineering programmes such as MBA / MCA / ME / M.TECH / M.Arch. Students who are interested to appear for the Karmataka PGCET Entrance Exam 2016 can complete the Karnataka PGCET Registration 2016 before the last date. Interested Applicants must go through the information bulletin carefully before going to apply for the Karnataka PGCET Application Form 2016. You should understand the Eligibility Criteria and then perform the Karnataka PGCET Online Registration 2016 because only eligible aspirants are allowed to apply for this Karnataka Post Graduate Common Entrance Test 2016. All the procedure related to the Karnataka PGCET Online Application Form 2016 is available below. Candidates who are having valid GATE score to apply for the Karnataka PGCET 2016 Online Application Form. If not means, the application form shall be rejected without any information. The completed details about the academic year eligibility criteria is available in the official website. 4. Karnataka PGCET 2016 Eligibility Criteria: For Full Time & Part Time: Applicants should passed the qualifying exam with 50% aggregate (SC/ST - 50 % marks). 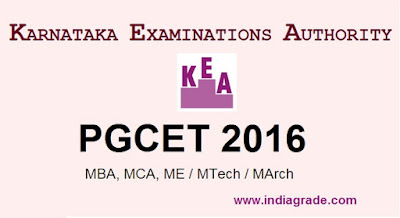 Applicants should apply for the PGCET 2016 Exam through online mode only (www.kea.kar.nic.in). You must register by using your basic details to generate the Application ID and Password. You must provide the valid E-mail ID & Password to apply for the PGCET Exam 2016. Now login into the website by using the Application ID & Password. Upload the recent passport size photo and signature in prescribed format. The payment of the Karnataka PGCET 2016 Application Form will be done by the Challan. Then download the Karnataka PGCET Application Form 2016 from the online web portal. Affix left hand thumb impression on the space provided in the Application Form. You should keep the Application form and Challan Copy during document verification.